I can’t count the number of times I’ve been to Rehoboth Beach, Delaware in my lifetime. The favored beach destination of dwellers in the Mid-Atlantic comes up numerous times on this blog, almost out of necessity (Read: here, here and here). This July 4th I spent an extended weekend there with Breeah, my grandparents and my uncle and little cousin. It was my fifth trip over there this year and my 15th in the last two years combined. It’s certainly made far easier that my grandparents are essentially locals, having inhabited the area since the early 80s and visiting for at least two decades before that. If I had to pony up the dough for a hotel, I’d have maybe been through on a day trip or two in that same two-year time frame. Blogging about a family-related weekend trip is a challenge for a blog like this though. Family experiences are personal and probably not that interesting to a majority of readers coming here looking for particular travel experiences, geographic oddities and what not. You’ll find my trip logs peppered with Rehoboth Beach and Minneapolis visits – trips I rarely dive into on the blog. That’s because when I’m in those places I’m spending time with loved ones and putting the epic geo-quests I love to do on hold. 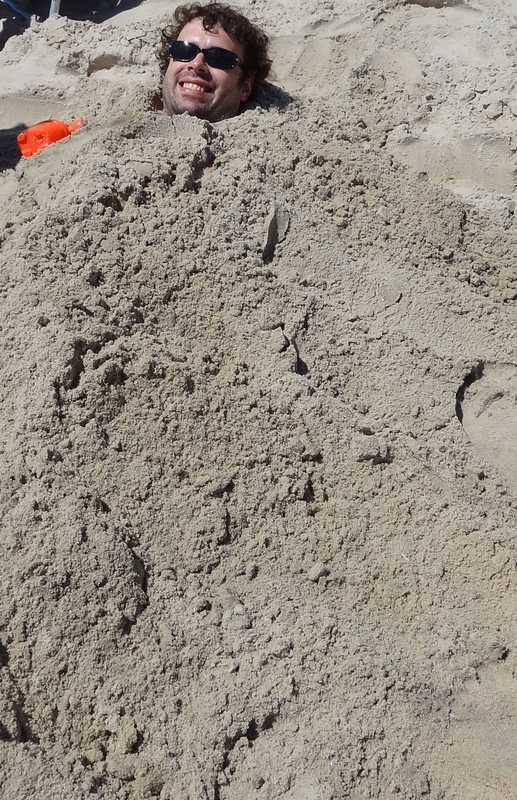 What’s become an annual family tradition: me getting buried under the sand at Rehoboth Beach. But this past July 4th was different. It was my first Fourth on the beach. I had never seen so many beach-goers at night – when most escape to their expensive bungalows, the crowded boardwalk or the Dewey Beach bars. It was also a first for my little four-year old cousin (with me at 31 years of age, I often mistakenly refer to her as my niece). This was her first fireworks experience and I was anxious to see how she’d react. Little did I realize I’d be in for a little geo-oddity treat that night. 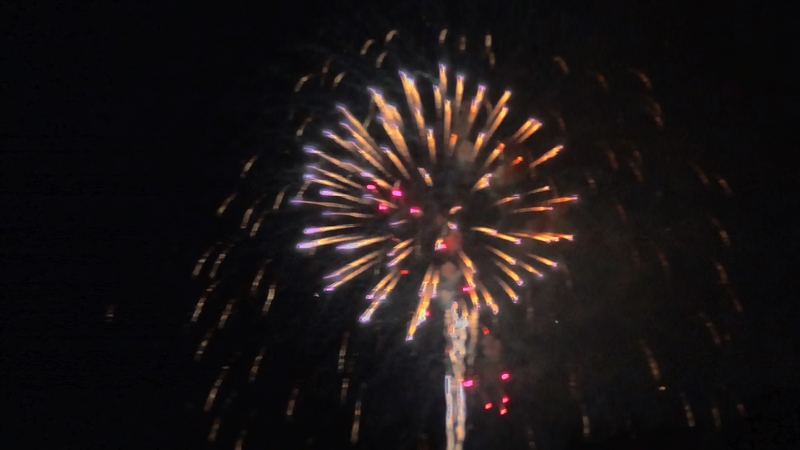 With fireworks blazing off near the Rehoboth Beach boardwalk and more going off in Rehoboth Bay, spectators were treated to two spectacular shows that kept everyone’s head on a swivel. Not only that, but the fireworks show in Ocean City, Maryland – only about 27 miles south could be seen in the distance. 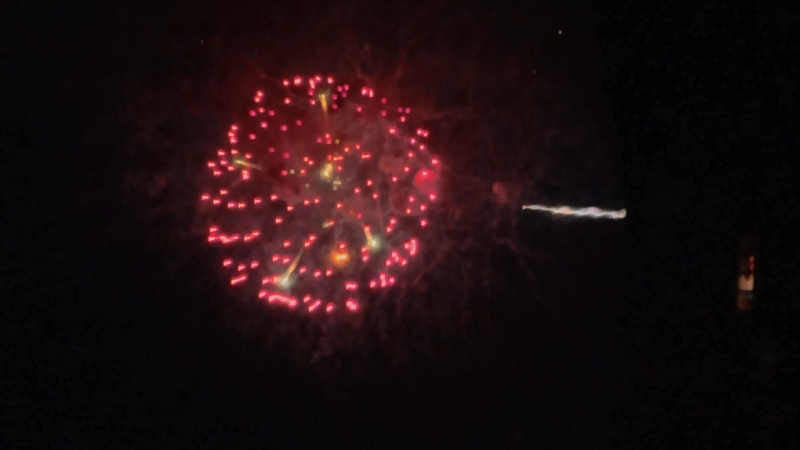 It doesn’t stop there, because the clear skies allowed the keen eye to make out the pyrotechnic display being launched from the New Jersey shoreline at Cape May, which is about the same distance as Ocean City – just over water. I had just seen fireworks in three states at the same time. Now, this can certainly be viewed in other places. I imagine if you got up on a perch anywhere near Hancock, Maryland, you can view fireworks going off in West Virginia, Maryland and Pennsylvania. But as far as officially sanctioned shows go, I couldn’t think of anywhere where one can so easily witness at least three of them in three different states (I actually witnessed at least four, with two of them in Delaware)? Perhaps the Sioux City divisions that South Dakota, Nebraska and Iowa all have their own shows? Maybe people in Montauk, New York can witness a local show along with views of the Connecticut and Rhode Island (or Block Island, R.I.) coastal fireworks. Feel free to chime in! I’m curious where else this can be done! I’ve seen fireworks simultaneously from DC, MD and VA, from the rooftop of an office building a couple blocks off of the National Mall. Right — I know — DC isn’t a state. As an added bonus though, due to the proximity of municipalities inside the Beltway, I saw probably a dozen or more simultaneous displays all along the horizon before the DC show started and obliterated all view of the others. Nonetheless, that had to be an amazing sight! Sounds far better than trotting down to the Mall that night amidst the throngs of people (something I promised I wouldn’t do again after last year). I think it is certainly fair to count D.C. as a pseudo-state in this argument.